A basic understanding of evolution lets us know that we are all descended, with modifications, from a common ancestor. If we trace our lineage back far enough we will find our kinship with fish over 400 million years ago (mya). Moving forward in time from our formerly fishy selves, we find amphibian relatives (~350mya) and reptilian relatives (~300mya). The animals representing the base of the mammalian lineage start to show up ~200mya. While it is certainly interesting to consider our distant relationship to these other megagroups of organisms, what I find particularly captivating are the things in between. It was in an intro geology course that I first saw a picture of a therapsid. These animals look like a cross between reptiles and mammals. As a biology major I understood that we, as mammals, are descended from a group of reptiles. However, it had somehow never quite struck me that there must have been at some time an abundance of animals between these two groups, organisms that wouldn’t quite meet the qualifications of modern mammal or a modern reptile, but would have some of the characteristics of each. 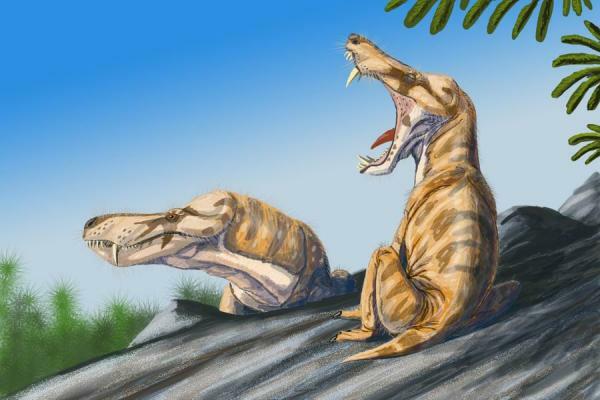 Looking at an artist’ rendition of a therapsid, it was fascination at first sight, and I have been studying organisms along this large-scale transition ever since. What is it that really differentiates mammals from reptiles? Some of the classic mammal-defining characteristics are mammary glands (from which we derive the name of the group), a four-chambered heart (note: these are also found in birds, though people rarely confuse birds and mammals), and hair. These appear fairly straightforward and are easy to identify in living organisms. However, if we go to the geologic record, we quickly encounter a problem—none of these characteristics fossilize well (if at all). 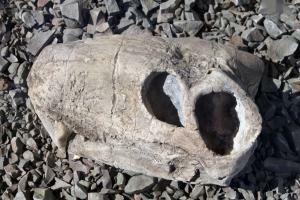 The predominant fossilized structures for vertebrates are bones and teeth. Surely there must be many skeletal differences between reptiles and mammals, right? As it turns out, there are not nearly as many as one might think. In fact, the best indicator to differentiate between these groups is to look at the three smallest bones in your body, found in the middle ear. This may sound a bit crazy so brace yourself—the tiny bones with which we hear, are actually used by reptiles to chew their food. Yep, that’s right. We hear with our (ancient) jaw. A reptile’s jaw consists of multiple bones and there is but a single bone in the middle ear, the stapes. In contrast, the mammalian mandible is composed solely of a single bone, but a series of three bones comprise the middle ear: stapes, incus, and malleus. Two of the bones in a reptile’s jaw (the articular and quadrate) are homologous with the malleus and incus in the mammalian middle ear. Homologous structures have the same origin and were inherited by a common ancestor, but have been adapted differently in different lineages. One might reasonably inquire, how can we possibly know that these are the same bones? Amazingly, this was first discovered in 1837 by a German anatomist, Karl Reichert. Reichert had come to this conclusion by dissecting pig embryos and finding that at early stages of development, pigs had what seemed like extra bones in their jaws and skulls. By tracking their development, he found that by the time of birth, these elements moved to the middle ear. Not surprisingly, Reichert’s announcement was met with significant skepticism. One of his biggest obstacles to acceptance was the lack of fossil verification. However, since that time, there have been a plethora of fossil discoveries corroborating his theory. The evolution of the mammalian middle ear is now one of the most well documented transitions in the fossil record, and represents an excellent example of exaptation—a repurposing of previously existing elements for an entirely new function. Fossil therapsid skull from South Africa (FunkMonkvia Wikimedia Commons) While we now possess a wonderful record of transitional fossils, a significant difficulty still remains. Each fossil only provides a single snapshot in time, one still-frame view of where the bones stood in their evolutionary pathway. They may document and indicate the order of these changes, but how does such an amazing transition actually occur? What developmental processes must take place to fundamentally change the position and function of these elements from chewing to hearing? The only way to truly understand how this occurs would be to study the changes in living organisms. Placental mammals, like the pigs used by Reichert, are limited in what they can tell us because the changes occur so early in embryological development and only exhibit a partial reconstruction of the transition. But are there any mammals whose development traces the full jaw-to-ear transition? Turns out there are—marsupials. I’ll tell you all about how modern marsupials are shedding light on ancient evolutionary events in Part 2.